For every influential designer that takes a stand for inclusion on the runway, there’s another that dismisses the need for diversity altogether. The Fall 2016 season saw New York-based designer Zac Posen make a powerful declaration that “Black Models Matter” by hiring an inclusive cast to model his collection, itself a tribute to a woman of color (the first East African woman to be admitted to the English bar, Princess Elizabeth of Toro). But across the pond in Paris, one of the brightest stars in the industry, Demna Gvasalia, only hired one nonwhite model to walk the runway at Balenciaga. Given the many rave reviews the collection garnered, the racial makeup of his cast seemed like an afterthought. It’s a message that reverberates through Fashion Weeks across the globe, from Paris to Milan. Along with people of color, plus-size, transgender and aged models continue to be underrepresented. There is still significant work to be done to eradicate that message of exclusion. The group’s work is not in vain. As this year’s Diversity Report proves, change is coming ever so slowly with New York leading the charge. For the Fall 2016 season, we examined 312 shows and 8,727 model castings from New York, London, Paris and Milan. 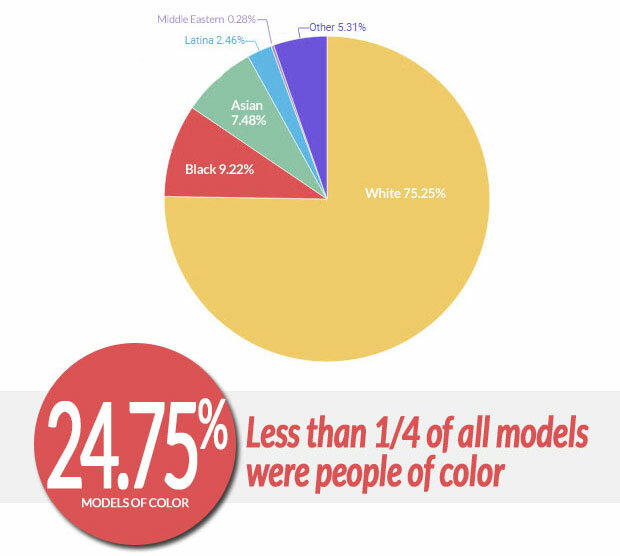 Less than 25 percent of the models cast were models of color. 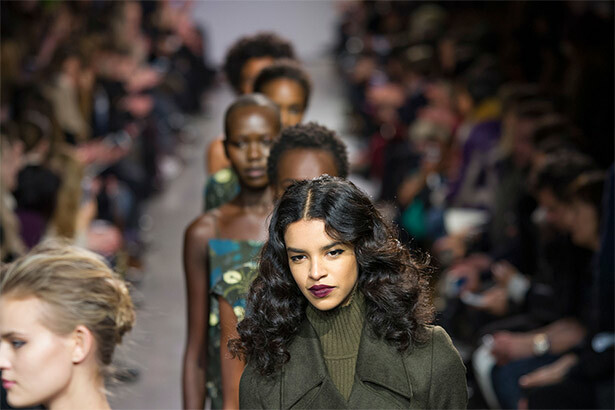 For all four cities combined, 75.25 percent of the models cast were white and 24.75 percent were models of color. This is a slight improvement from Spring 2016, which was 77.6 percent white and Fall 2015, which was 80 percent white. 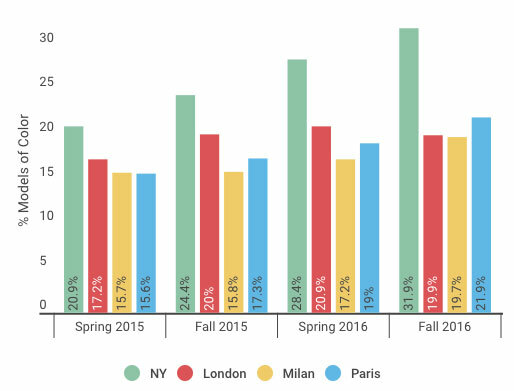 New York was by far the most diverse city for the Fall 2016 season (31.9 percent models of color) followed distantly by Paris (21.9 percent models of color). Over the past four seasons, New York has consistently been the most diverse city with steady improvements in castings of models of color. This season’s percentage is up from 28.4 percent for Spring 2016, 24.4 percent for Fall 2015 and 20.9 percent for Spring 2015. Milan and Paris have seen slight improvements season over season since Spring 2015. London is the only city that was actually less diverse for the Fall 2016 season than prior seasons (Spring 2016 and Fall 2015). The shows that led the way in terms of inclusion were mostly in New York. 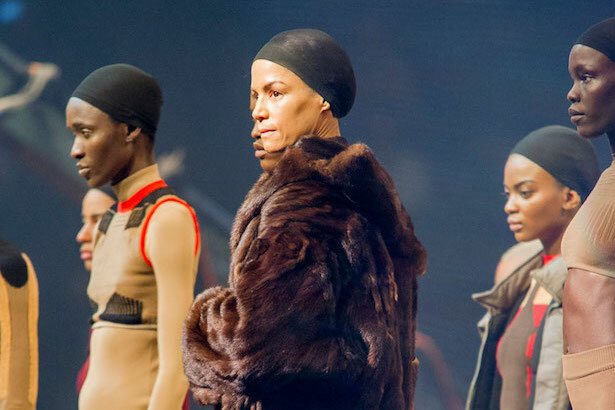 First place honors go to Kanye West, who sent 100 percent models of color down the runway for Yeezy Season 3. Zac Posen came in second place with an 87 percent diversity score, an increase from his 61.9 percent ranking in Fall 2015. At Chromat, 85 percent of models were nonwhite, up from 70 percent the prior season. 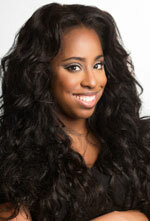 Not far behind was Sophie Theallet, who cast 54 percent models of color, a slight decrease from the brand’s Spring 2016 ranking (60 percent), but a significant jump from its Fall 2015 score (5.3 percent). Despite the industry-wide call for diversity, some designers failed to hire any models of color. 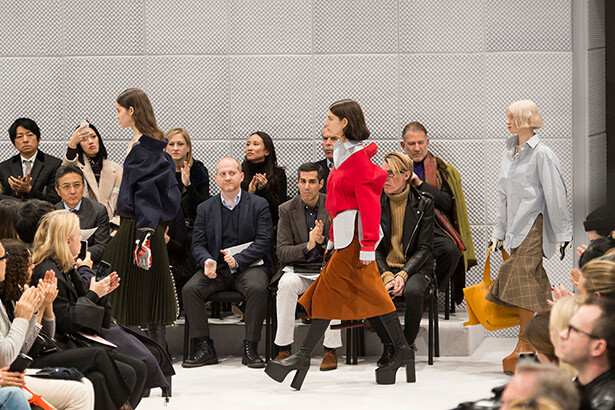 For the second season in a row, Junya Watanabe and Comme des Garçons had entirely whitewashed lineups. Balenciaga cast only 1 model of color out of 44 and Ann Demeulemeester hired 1 model of color out of 25, a dismal improvement from the Fall 2015 season when the brand hired no models of color. Two major shows, Saint Laurent and Yigal Azrouël, were only 5 percent diverse. Saint Laurent is a repeat offender. In Spring 2016, the Saint Laurent runway was less than 7 percent diverse and in Fall 2015, it was only 7.1 percent diverse. Given these findings, it’s no surprise that among the top 10 models with the most bookings for the Fall 2016 season, 8 out of 10 were white. Only two models of color made this season’s in-demand list: Lineisy Montero and Sora Choi. Body diversity continued to lag far behind racial inclusion. At all the shows in New York, Paris, Milan and London, there were only six plus-size model appearances. That’s a significant regression from Spring 2016, which saw 14 plus-size model appearances. At New York Fashion Week, Denise Bidot and Sabina Karlsson walked in Chromat and Candice Huffine and Marquita Pring made an appearance at Sophie Theallet. In Paris, Ashley Graham and Myla Dalbesio modeled for H&M Studio. Plus-size models were the least represented group for the Fall 2016 season. This season, 11 aged models walked the runway. Notably, veteran supermodel Veronica Webb walked for Yeezy Season 3 and Sophie Theallet in New York, while Pat Cleveland walked for H&M Studio and Redemption in Paris. This marked an increase in representation as there were only five aged model appearances in Spring 2016. For Fall 2016, eight transgender models were cast at Fashion Weeks in New York, Paris and London. That’s a slight increase from the Spring 2016 season, which saw five transgender model castings in total. Milan is the only city that did not cast any plus-size, transgender or aged models. If only more designers viewed diversity as one of society’s greatest strengths, we could continue making progress in the fashion industry both on and off the runway. With additional reporting from Benedikte Bergevik.